Croatia's rich cultural heritage is matched only by its amazing natural beauty; this stunning coastline of sandy beaches, unspoilt islands, tourist-free villages and barely-visited historic sites is perfect for exploring on foot. Travelling with our local guide, in an air-conditioned vehicle, we follow easy coastal paths to rocky coves and forest paths leading to tiers of shimmering waterfalls. We'll also visit the many historically significant sites that have influenced modern-day Croatia. There's the UNESCO-listed old town of Dubrovnik, where well-preserved ramparts surround a honeycomb of Renaissance churches, secret courtyards and sumptuous merchants' palaces. Founded by the Romans, Split's famous UNESCO Diocletian's Palace was once the Emperor's retirement home. Today its warren of narrow alleys houses the town's cathedral, while its cavernous cellars are used as art galleries. Finally it's on to Trogir, where the first Greek settlers landed, listed by UNESCO for its wealth of classical buildings such as St Lovro's church and the Venetian loggia. We're extremely pleased with our choice of hotels too. In Dubrovnik, we stay in a ***** hotel on the Lapad peninsula with its spectacular cliffside position offering superb views. 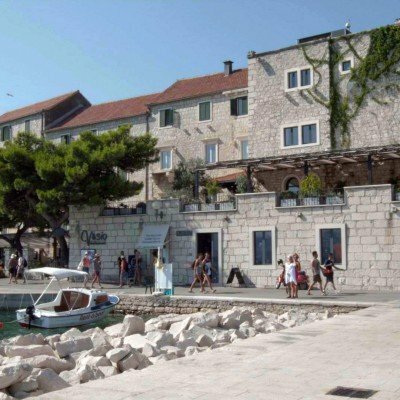 On Brac, our ** hotel in Bol, a pretty honey-coloured stone mansion, lies on the harbour front, with all rooms affording sea views. Our **** hotel in Trogir is in the old town, run by the Buble family, whose history in the town can be traced over eight centuries. Evening meals and some lunches are taken in local restaurants where we'll savour the excellent regional cuisine. Air-conditioned rooms are guaranteed throughout. This holiday follows easy coastal trails through pine forests and hidden coves. Inland we walk on even, stony mule tracks. Walking boots are essential. In order that you see as much of this varied region as possible, transfers by minibus or ferry are included on most days. Please refer to the itinerary for timings. Arrive at your hotel in time for dinner in the old town. On the way to Jasenice we stop first at ancient Epidaurum in Cavtat for a gentle stroll along one of the peninsulas. Then it's on to the hills, to Jasenice, where a cobbled path lined with rosemary winds across an open valley dotted with oak trees with Mount Snijeznica (1,234m) to our right and Mount Straziste ahead. Dubrovnik's mountainous coastline frames the horizon as we descend through meadows bright with crocuses to Ljuta where we'll lunch on lamb and fish cooked in a traditional peka (charcoal oven). There's free time this afternoon to enjoy a quick dip in the hotel pool before a guided tour of Dubrovnik and dinner. Tiny Kolocep Island, networked by mule tracks and without cars, is just 30 minutes from Dubrovnik by boat, but it feels like another century. Walking past agaves and prickly pears we reach Gornje Celo harbour with its painted fishing boats, then continue on through pine forest to discover a ruined Napoleonic fort. We return past houses bright with bougainvillea and pomegranates to admire limestone cliffs buffeted by azure seas. There's free time this afternoon to visit Dubrovnik's mediaeval ramparts, Renaissance churches and Doge's Palace before dinner in Dubrovnik. Today we head to Brac Island via Ston (3hr transfer includes 10km along the Bosnian coastline), famous for its oysters. We continue on to Makarska for lunch, followed by a stroll on the peninsula of St Peter before boarding the ferry (50 mins) to Brac Island. After the ferry it's a 40-minute drive to Bol, our home for the next two days. We arrive just in time for dinner in a lovely traditional restaurant locally known as Konoba. Today we visit Blaca Bay where we'll learn how monks once exported 70,000 litres of wine a year to Venice and had a Viennese piano hauled up here, before following a coastal path that winds through pine trees to turquoise blue coves where we'll stop for a picnic. Then it's a last swim on Bol's horseshoe sandy beach before dinner in the old town. It's a 40-minute drive to Skrip, the oldest village on the island, where we visit a folk museum, housed in a C17 tower built to fend off the Turks. We then stroll gently past olive groves and figs to Splitska where we board the ferry (50 mins) to Split for lunch. Then we'll join the guided tour of split where we visit the UNESCO-listed Diocletian's Palace, Romanesque cathedral and old city walls before continuing to Trogir where we'll spend the last two nights. We drive to Krka National Park (90 mins) to observe a myriad of lakes and waterfalls. A stony path lined with Aleppo pines gently descends to the Cikola river, then a brief ascent rewards us with views over the park. After a picnic, we'll explore the tiers of ponds bright with yellow water lilies that shimmer below the mighty Skradinski waterfall. Then we head back to Trogir to explore the old town before our final dinner. Situated on the beautiful peninsula of Lapad, the Hotel Dubrovnik Palace's dramatic cliffside location, below aromatic, pine-covered woods, affords it spectacular views in every direction. Of all the five-star hotels in Dubrovnik, this one stands out with its luxurious spa and wellness centre and spectacular sea views from every room. Designed to resemble an ocean liner from a distance and with touches of wood and natural stone, every effort has been made to ensure that it blends in with its surroundings. Inside, the ornate tapestries in reception are just two of the many works by local and national artists that can be found throughout the hotel. 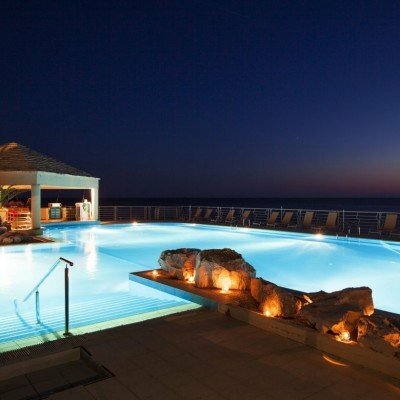 With four swimming pools (one indoor), a private beach, tennis courts and snorkelling as well as a leafy jogging path and walking routes through the woods behind it, the hotel is able to provide a host of activities all just a short distance from Dubrovnik Old Town. Room upgrades: Deluxe sea view with balcony or Single deluxe sea view with balcony. Deluxe rooms are approximately 6m2 larger than the superior rooms and also have a sofa. The Hotel Kastil enjoys an enviable position in the middle of Brac's harbour front, commanding stunning sea views across to the nearby island of Hvar. Most of its thirty rooms enjoy sea views and are all ensuite with satellite TV, air-conditioning ,minibar and telephone, and are furnished in a contemporary style. Situated in the centre of UNESCO listed Trogir, amongst a labyrinth of peaceful, charming streets, is the Hotel Pasike. Opened in 2004 after the extensive reconstruction of an old family house, the hotel is furnished with unique 19th and early 20th century furniture, something that only adds to its already existing charm. Although located in a quiet place in the town, the hotel remains close to the museum (a UNESCO World Cultural Heritage site) and is also just minutes away from Kamerlengo Fortress and the Cipiko Palace. The Cathedral of St. Lovro and Trogir Main Square are also within half a mile. Transfers included from Dubrovnik airport at 15:55, and back to Split airport at 10:15. Superb holiday with wide mixture of culture and walking accentuated by excellent weather. Guide and his driver were excellent companions throughout the holiday, and as your records will show, our party comprised just two couples which gave the feeling the six of us we were on a family holiday. This was an excellent holiday, with a 1st class guide, Jakov Vucak, infact he was the best guide we have had in over 20 years of holidaying with Headwater. It was an unusually small grouo of 4 travellers, and with his great sense of humour he built an easy rapport with each of us. He led the walks with confidence, ensuring we were safe at all times. We found his knowledge and passion about all aspects of Croatian life added to our enjoyment- particularly his pre dinner explanations of the geography of the former Yugoslavia and the history of the recent war. Mateo, our driver was also fun to be with , and his careful driving made us feel safe. The sites we visited were fascinating and we benefitted from the tours with the local guides in Dubrovnik and Split. We had booked an extra night in Dubrovnik and this was useful as it enabled us to walk the city walls as well. Each of the walks were different, and not too taxing, apart from the steep hill to finish the last walk! The hotels were in great positions and different from each other, which is one feature we love about Headwater holidays. We ate at some brilliant restaurants and the food was always good, sometimes exceptional. However, I felt that on more days I would have preferred the picnic lunch and coffee option mid day rather than 2 restaurant meals in same day. This was a holiday we will remember for a long time. Our guide, Ivan, was knowledgable and passionate about his country but more than that he was a thoroughly delightful person. I really enjoyed Croatia but found the holiday too "guided" For example I would prefer not to have to eat in a group of 12 every night as nice as the group were. In our last hotel (Pastike), we all seemed to get a very different standard of rooms and we seemed to draw the short straw with a very small room with poor air conditioning. Our fellow travellers descibed suites, jacuzzi baths, sofas and beautiful views. We had tried to upgrade on booking but were told it was not possible at this hotel. However, i think it was my mistake to book a guided holiday without really understanding what that would entail so next time I will be sure to book our usual self guided cycle! Overall an excellent holiday. Everything was well organised and ran smoothly. Our guide was first class - well informed, attentive and with a good sense of humour - he quickly established a good rapport with the whole group and nothing was too much trouble for him. The locations visited were varied and most interesting. The travel by minibus was comfortable and appropriate and the driver was friendly and careful. Good balance between walking and touring with cultural visits and exploration of Krka national park. The holiday was a great mix of walking, sightseeing and eating lovely local food. Our guide was excellent and informative about all aspects of life in Croatia. Perfect combination of walking & sightseeing. Wildflowers were at their best at this time of year. Sasha, our guide, was excellent & went out of her way to ensure everyone had a good holiday. A mixture of beautiful walks and site seeing at 3 UNESCO World Heritage sites. A great introduction to Croatia. We loved our Dalmatian Coast adventure. Sasha was a wonderful host and really made the holiday just perfect. The walks were great and we visited some beautiful places but some of the group found a couple of them a challenge in the heat, not sure they were graded appropriately? Hotel Kastil and Hotel Pasike would not have been our first choice of hotels but, nevertheless, this didn't detract from our enjoyment of the holiday. Would highly recommend this holiday if you want to explore this part of Croatia. This was an excellent holiday. Croatia is beautiful and the walks were very nice giving a wide range of things to see. I cannot praise our guide, Sasa, or our driver, Thomas, enough. They both worked so hard to make the holiday fun and exciting and they really did go the extra mile to look after us. The group I was with were great too and lots of thanks go to them as well for making the holiday such fun. Headwater's Delights of Dalmatian Coast Walking Tour was just that - delightful. Croatia is stunning and the tour took us to interesting and varied places from bustling Dubrovnik and Split to beautiful trails around Dubrovnik, the surprisingly interesting Blaca Monastery on Brac Island and the trails and waterfalls of Krka National Park. Trogir was an unexpected small town gem. The walking was not difficult and on several occasions well off the beaten track with beautiful views. Headwater did a good job on selecting hotels - two were excellent and our outstanding tour leader, Sasha, found excellent restaurants for lunch and dinner. Sometimes we felt we needed a few extra miles of walking to offset our meals. The experience was enhanced by Sasha, our tour leader, who was enthusiastic, knowledgeable, eager to help and always had a smile. And to top it off, we were fortunate to be part of a fun, compatible multi-national group. We will look for other opportunities to travel with Headwater. Really enjoyed it, with Sasa and Tomas the driver both major factors in this. Very varied, with Dubrovnik and the hotel there a particular highlight. This holiday is a brilliant introduction to Croatia, with so much packed in a short time. The guide and driver could not have been more helpful, friendly or enthusiastic. All the hotels were wonderful and there was plenty of choice at meal times to suit all tastes. All in all a fantastic experience. A superb holiday, wonderful accommodation, good mix of walking and sight seeing, all supported by a Brilliant guide who charmed us all, she was so lovely and caring and gave us a good personal view of Croatia. The holiday was extremely enjoyable. Our guide was Vanja and she was excellent, We loved Dubrovnik - especially at night after the crowds had gone and the City was all lit up. The walking was good and we particularly enjoyed the walking in Krka National Park. A little disappointed with Diaclecians Palace in Split - expected it to be more impressive and interesting. We were impressed by the Dubrovnic Hotel. Great trip: stunning scenery & interesting/beautiful towns; lots of features packed into 1 week; lovely people and Saša guided us around her country with enthusiasm. Wonderful time. The 3 location concept was very good and was what attracted us to the holiday. It gave us a very good overview of that part of Croatia and it was entirely suitable to the older generation. The delights of the Dalmation Coast walk is a wonderful mix of walking and culture.The area is truly delightful as the holiday name suggests. The holiday was made extra special by Vanja, our wonderful, cheerful, enthusiastic, helpful and overall perfect guide! What is great about a small group holiday is that when circumstances require it, the itinerary can be changed very quickly and seamlessly and we still have a fantastic day. The only minor problem is that the menu choices were often limited although the places we ate at were generally good (do not expect fine dining!). We decided to combine the Highlights of Montenegro Walk and Delights of the Dalmatian coast Walk. We took the first date in May. Imagine our surprise on waking on the first morning, to find a thick layer of snow had fallen overnight and was continuing to snow quite heavily. We hadn't anticipated snow at all and ended up wearing as many clothes as we could! However it made the mountains and forests look even more beautiful. It started to melt the next day and conditions were very slippery. Poles were needed by most people. In Croatia the temperatures soared into the 30's and we found the walks on day 5 and day 7 very challenging, steep, stoney paths,very hot. We felt this was more than a one boot holiday. The first hotel in Dubrovnik was five star and very nice but not necessarily needed for a walking holiday, especially as we had virtually no time to use the facilities. We had great guides and drivers and everything was very well organised. We had an enjoyable holiday in amazing scenery. Stunning scenery, well chosen itinerary and hotels, knowledgeable and helpful guides. A busy programme. We had a brilliant time in Croatia; it was our first time there and we can't wait to return. Our guide, Krsto, was very informative and helpful, and the itinerary was interesting. The holiday was made perfect by are wonderful guide Sanja . This was my first visit to the Dalmation coast it is truly the very best coast line I have ever seen so clean and the people so friendly . The group were both interesting and good fun we were 14 and I do think that was perfect . The food on the whole was some what disappointing it would have been nice to have eaten in the hotels . My only other comment would be the grading I felt that all though we did not do a great deal of walking some of the walks were very testing and more like a 2 boot . This was my first time with Headwater I will be traveling with them again very soon hopefully . An excellent holiday with a nice combination of sightseeing and walking in the beautiful Dalmation Coast. A good holiday was made great by the fantastic Sanja Reiter who was an outstanding guide. As a PhD student of Croatian history she brought a special advantage for briefing us and telling the story of the region and the country. One slight disappointment was the limited choice of dishes as we always seemed to be 'off-menu' and it was especially hard for one of us a non-fish and seafood eater. And Headwater can't help Croatian food! But overall not too bad and the breakfast buffet at Dubrovnik Palace Hotel was outstanding. Don't miss this super holiday. A very good holiday for sightseers who want to do some walking as well. The Dalmation coast must be one of the most beautiful places in Europe. Sanja , our guide was incredibly knowledgeable about almost anything we asked . She has a great sense of humour and it always seemed that she was enjoying her time with our group and not just doing a job . Would have liked a whole day to discover Dubrovnik . Holiday spoilt by poor quality of lunches and evening meals . Very intereesting tour, with good local tour guides. Could have done with more free time in Dubrovnic so a closer hotel might have been useful. However, the facilities and beach at the Hotel Dubrovnic Palace outstanding. The only problem with our holiday was that we did not receive the good quality maps which were promised and which we would still like to receive! Our walking holiday in Dalmatia was our first experience of a group holiday, so we weren't sure quite what to expect. Fortunately, our guide, Sanja, took us all in hand and her good humour and efficiency made all the difference. We cannot speak highly enough of her. We were also fortunate in that we got on well with all the other members of the group, and the atmosphere generally was very good. We didn't do quite as much walking as we had hoped - the first day was virtually rained off - and we spent quite a lot of time on the minibus, but it was worth it to be able to enjoy three such excellent locations in one week. Some of the group thought the standard of food in the first few days was not high enough. We're not complaining but we would have been prepared to pay a bit more for a wider choice. Anyway, it was a most enjoyable week and we would certainly consider going on another Headwater holiday. Croatia is a beautiful country with miles of unspoilt coastline , lovely islands and friendly people . Dubrovnik is a fascinating city and the waterfalls at Krka were spectacular .The holiday was extremely enjoyable and our guide Sanja was very helpful and a delight . An excellent holiday: a beautiful country, perfect weather, wonderful walks/culture tours, good company, delicious food, lovely accommodation and a brilliant guide in Sanja. We have undertaken 9 holidays with Headwater and they have always delivered what they say they would deliver. The guides are the cream of the crop , Sanja was one of T&E best we have had in the 10 years of Headwatering . Well organised, excellent guide and transport. Expensive compared to package tour but well worth the extra for the personal service and all the organisation is done for you! Tours, visits and hotels well chosen and walks were lovely. Very enjoyable holiday with an excellent guide. The walk was certainly not leisurely but everyone managed it. The distances were not great but the gradients were steep and taxing, especially in 30 degrees of heat. Excellent holiday, with even more value added by leader Sanja, who made sure everything ran like clockwork. She was also most informative and helpful, very patient, and with a great sense of humour. Selected Sundays from 16th Jun 2019 to 6th Oct 2019, for 7 nights. All dates are subject to availability, please contact us to check. Due to the tailor-made nature of our holidays, we need a little more information in order for us to check availability for Delights of the Dalmatian Coast Walk. Simply complete the form below and a member of our sales team will contact you (when it's most convenient for you) to provide availability information, travel options and an accurate price. Of course there's no obligation, but if you do wish to proceed with a booking they will be on-hand to assist you throughout the process.